Create with Seongsook: Change is always not easy. Change is always not easy. I was asked why I changed blog. Well... the Blogger didn't let me post or edit any of my posts at that time right after I celebrated my three year's blogoversary. I was desperate to announce the winner of my give away without any success. I haven't been posting much lately although I have tons of photos of cards to share with you all since I have created a new blog because of the problem with Blogger. I just didn't have time to explore all those extra things on the new site. Change is always not easy. This morning, I am testing my blog again. Let's see how it will treat me this time. If it works, I will try to post here first. My Stampin' Up! friend, Selene Kepmton, sent me a box of supplies for donation for me to make cards for the Operation Write Home. She sent me a box of card fronts a while ago, too. What a wonderful surprise for me and great sharing of her! Thanks SOOOOO MUCH to Selene for her support as always. Wishing you a blessed day. Very nice indeed! There are a lot of cards in that box!! That's wonderful. What a generous friend. I know you'll put them all to good use. Much Love to you Seongsook! :) I'm so excited that you got everything, and look what AMAZING things you're already doing with what I sent. YEA!!! hugs! Thank you ladies for your kind words and support. I am so blessed. 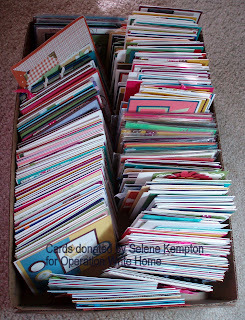 What a ton of cards! I'd love to be able to see the fronts of them, but it would be a huge posting, wouldn't it?! 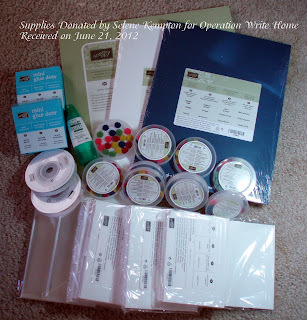 A couple of my friends have Stampin Up demonstrators that donate to them to make cards for OWH. How nice of those demonstrators. I don't have one to do that for me but how nice if I did. Your cards are always awesome and I love to see what you come up with all the time. God Bless you and your generous friend.